A new overnight expedition was called for and a good South Easterly breeze seemed to offer a chance to explore to the West. So it was that Aimee, Jan, Millie and I set off for an over night trip. 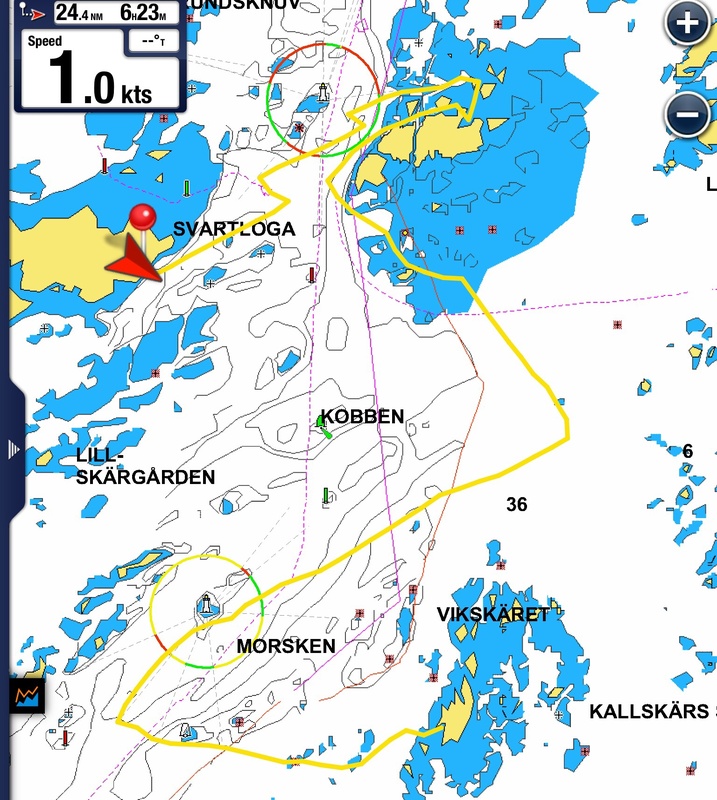 We beat towards Rödloga, but the wind had shifted and we had to beat along the channel too. The girls wanted a lunchtime swim stop, so I took us to Vindelskar again, though we anchored this time. History repeated itself for us, as the sky grew darker and rain promised and strong winds blew up. We had swum and lunched by then, so I had the anchor up before the rain arrived. However this time, when the rain set in, the wind dropped to almost nothing and soon we were motoring South with the main flopping about. A decision was made to seek shelter from the nearest island, which was… Kallskar! However, I was happy enough: the others were happy to see that island and I did not relish motoring the 7nm to our planned destination. This time the harbour was even fuller, but we ended up on precisely the same anchorage as last time! 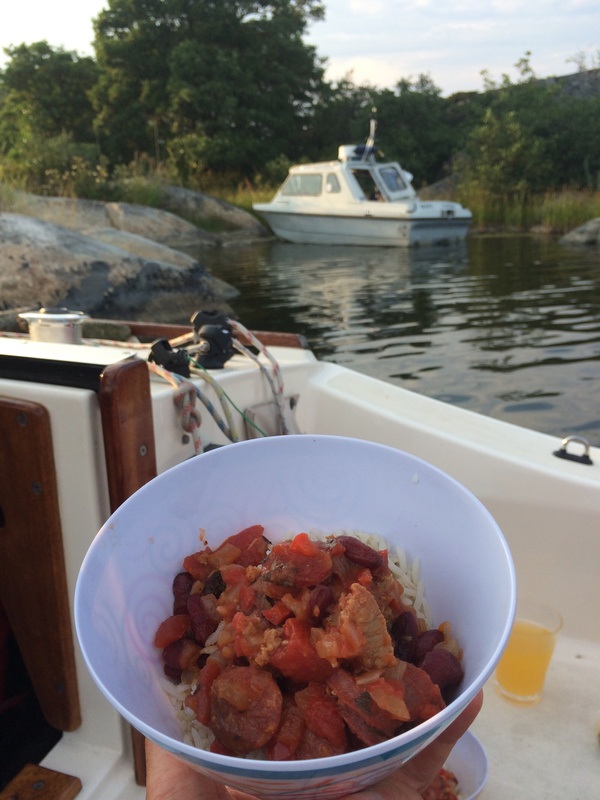 After the girls had another swim and Jan and I had a walk, we had a lovely dinner from the thermal cooker, a kidney bean casserole with lamb and chorizo. After our expedition, we had a late start on Tuesday. There was little wind when we woke, anyway. The morning was spent swimming, during which Trevor laid buoys on the rocks in the harbour entrance. The water is extremely shallow in places! After lunch we had a walk from the jetty through the village. Svartlöga had a permanent population until a little after WW2 (it was saved from invasion by the Russians due to the large number of rocks around this island, so the story goes). The population were sustained by herring fishing and there were cattle (the “pasture” is now a football pitch). Until a few years ago, there was also a shop, but that finished when the shopkeeper finally retired. With no permanent population on the island, there is only enough trade to keep a small ice cream and sweet shop open; they were doing a roaring trade today. The photo shows the middle of the village; the shop was the middle building on the left. By the time we got back to the house, there was too good a breeze to waste, so Niki, Jarn, his daughter Millie and I went for a turn around the bay. The new “channel markers” worked a treat and for the first time, we did not scrape the bottom once. We had a lovely sail on main and staysail, beating out to a nearby island and then a reach and a run back. Almost 6 nm. Having tested the water, so to speak, we decided to make an overnight passage. With a crew consisting of myself, Trevor, his son Stefan and his nephew Felix, we set out to see where we could get. The weather was still hot and the wind was very light, so we made slow progress from Svartlöga to the channel. Eventually, there was so little wind, we had to motor and we decided to find a nearby island for some lunch and a swim. 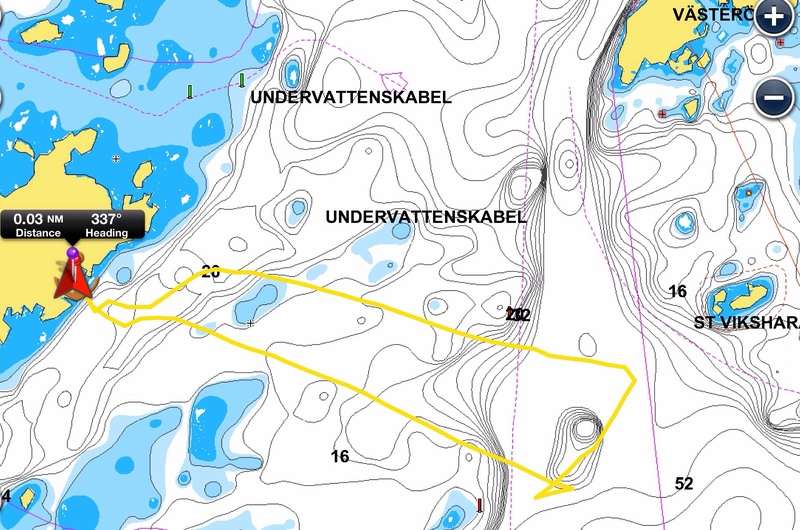 Vindelskär fitted the bill nicely, and we motored along its North side until we found a place where we could bring the bow tight up to the rock. Having found a likely spot, we anchored the stern, motored in and secured two bow lines to large rocks. This was the first time Aurora had been moored “Swedish Style” and I was pleased it had gone so smoothly. We then cooled off with a swim and then had some lunch of cheese and biscuits. During this time, I noticed the sky getting blacker to the West and the wind starting to pick up. “We may get some rain”, I thought and decided to move off as soon as lunch was finished. Quite quickly, I noticed the boat moving sideways with a wind shift, and thought we had better move off immediately. It was not a moment too soon, as within a few minutes, a fierce squall blew in. Whereas previously a very light breeze had been blowing off the shore, now a strong wind was whipping across the shore and bring up a surprisingly large swell. We got the warps off, but I. The cross breeze, could not do it without leaving a crew ashore. Stefan, having volunteered, could only watch as we recovered the anchor and tried in vain to approach the shore to pick him up. It became clear that we could not pick him up there and in the end he had to make his way to the far end of the island, so we could recover him. After that excitement and with the squall now throwing buckets of warm rain on us, I pointed the boat downwind and we ran with the wind on staysail only. After half an hour or so, thing calmed down and the wind dropped considerably. 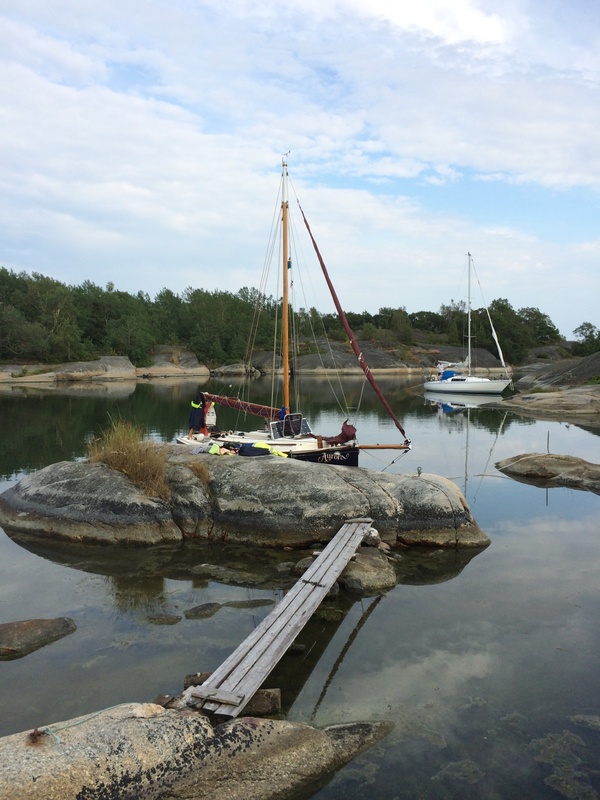 We put up the main sail and made our way to the island of Kallskär, a place Trevor knew from visits many years ago with his grandfather. There is a natural harbour there, entered by a very narrow passage I to a sheltered lagoon, which was obviously was a popular destination. We again managed to moor to the rock and were able to easily hop off the boat, though this time we arranged the warps so we could recover them without going ashore. 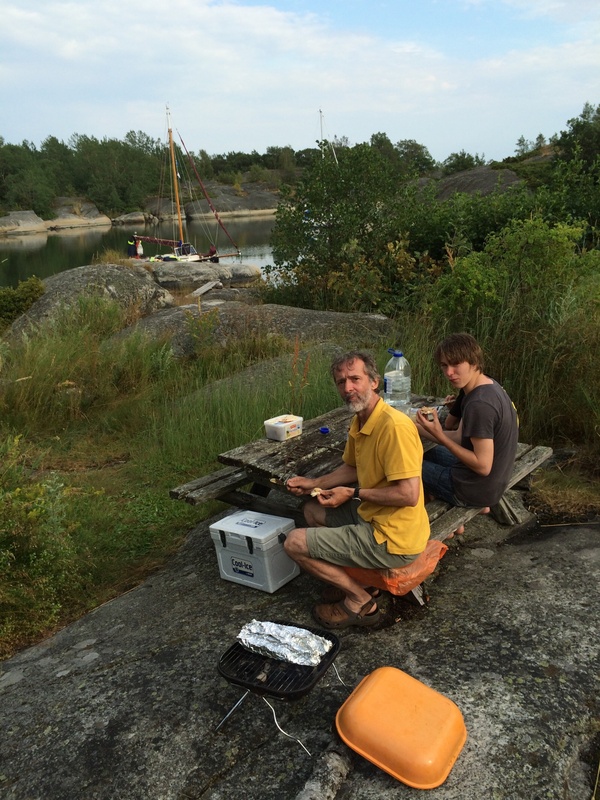 Trevor then set a barbecue and we feasted on grilled fish caught the previous day at Svartlöga. The boys found a place to jump from a high rock into the water, whilst Trevor and I explored the island. We passed a peaceful night and awoke to (another) gloriously sunny morning. 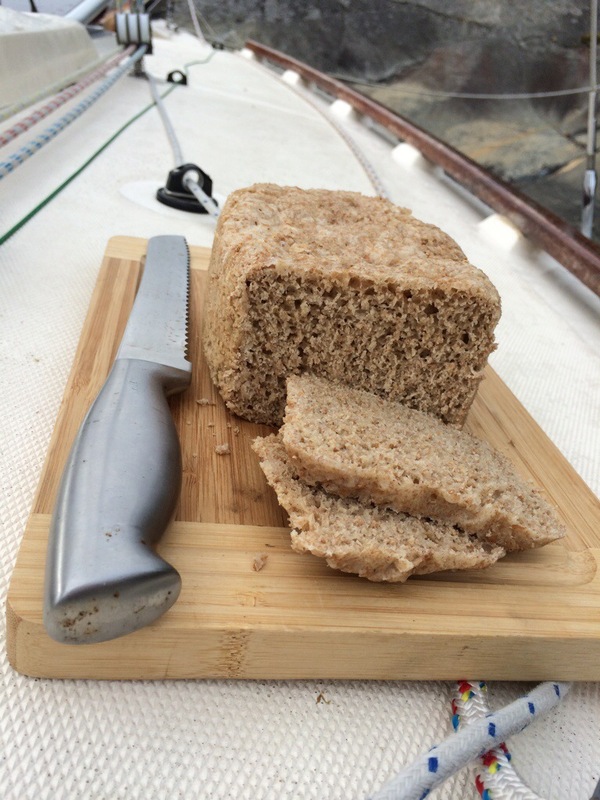 With the damp gear drying and the battery charging in the warm sun, we had breakfast of fresh bread cooked in the thermal cooker. Although I had left the trivet at home, so the bread was a little uneven, it was all consumed quickly enough. We decided to return to Svartlöga, as there seemed little wind and were soon sailing nicely on a three sail reach, exceeding five knots. Trevor wanted a close look at the lighthouse on Morsken, whose light he often saw from Svartlöga, but which he had never seen at close quarters. 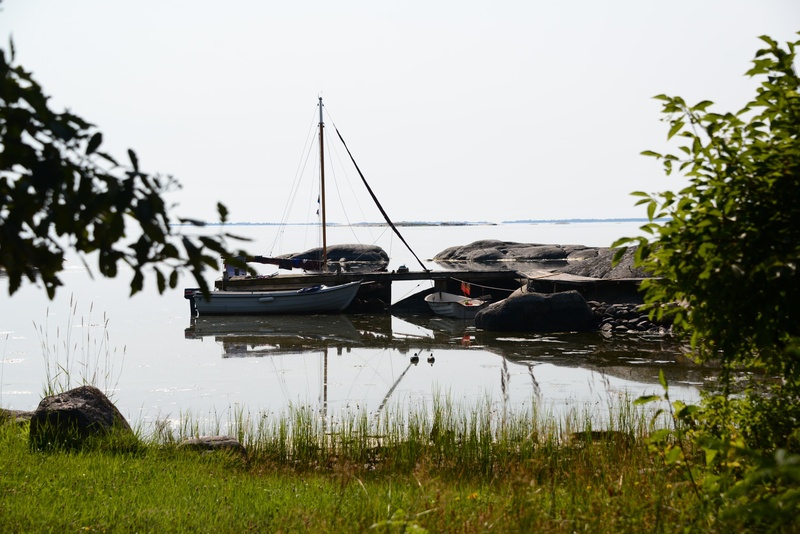 The wind built steadily and soon we shortened sail to main and staysail and soon arrived at Rödlöga, having tried unsuccessfully to make a lunch stop at Viksharan. 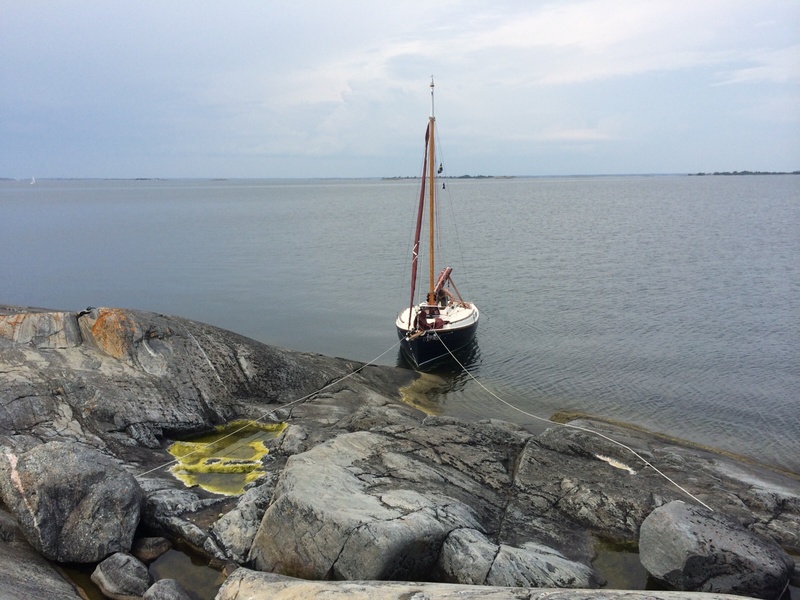 Having bought some supplies and an ice cream from the shop, we then had an exhilarating beat back to Svartlöga on reefed main and staysail, in what was now at least a F5. The entrance to the harbour was interesting, but with lots of hands on the pier, we were easily caught and moored on the down wind side. Having got afloat in record time the previous day, there was still a certain amount of loading to be done before we were ready to leave, so having had a well earned lie in, it was almost midday before we set off. 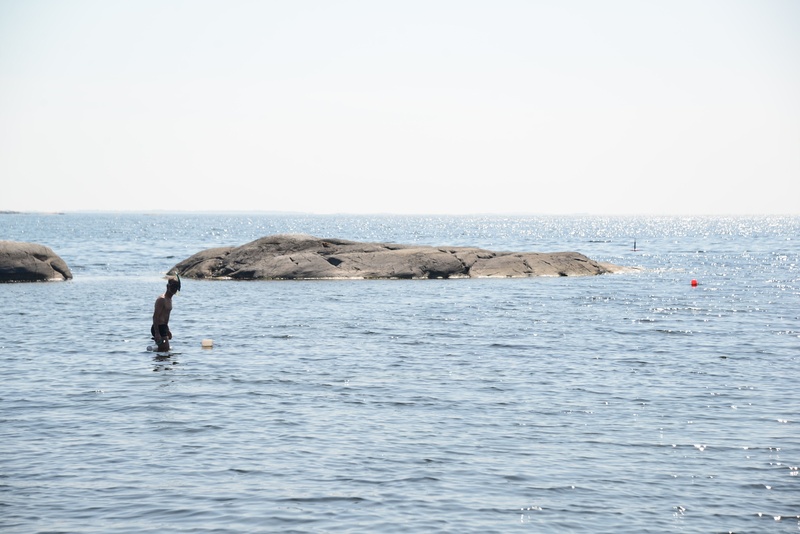 It was not without trepidation, because although there are no tides to speak of in the Baltic, there are uncounted rocks above and, worse, just below the surface of the water. When I said to on of the locals that I was sailing to Svartlöga, he replied that they did not often go there because it was “a minefield”. We stuck to the channel and beat up towards Furusund well enough, but were struggling with the number of motor craft passing closely and at speed. The narrowest point has a chain ferry, so we dropped the sails and motored. 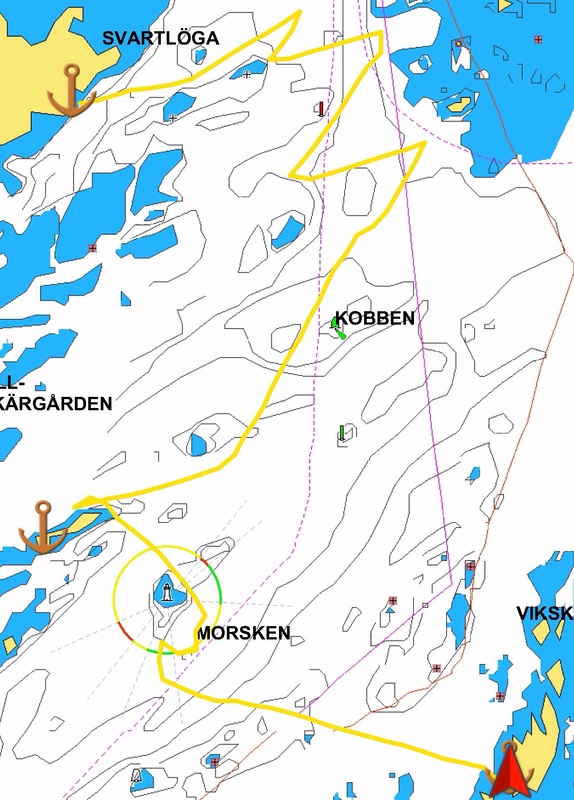 Whilst the sails were down, we pottered into the harbour at Furusund to look at the slipway (a potential recovery point) and also check out mooring “Swedish style” (moored to a buoy aft and with the bow against the pontoon). The slipway looked fine, but with only two of us aboard, we took a rain check on mooring. As the afternoon drew on, the wind dropped and the temperature rose. We dropped anchor at an island called Blacke and had a wash. Aimee swum under boat and we took some welcome dives into the cool water. The weather had been settled and hot for about a wee, with little rain for a month. This conspired to produce the lowest water level for many years. Not so good for us, weaving through the rocks. 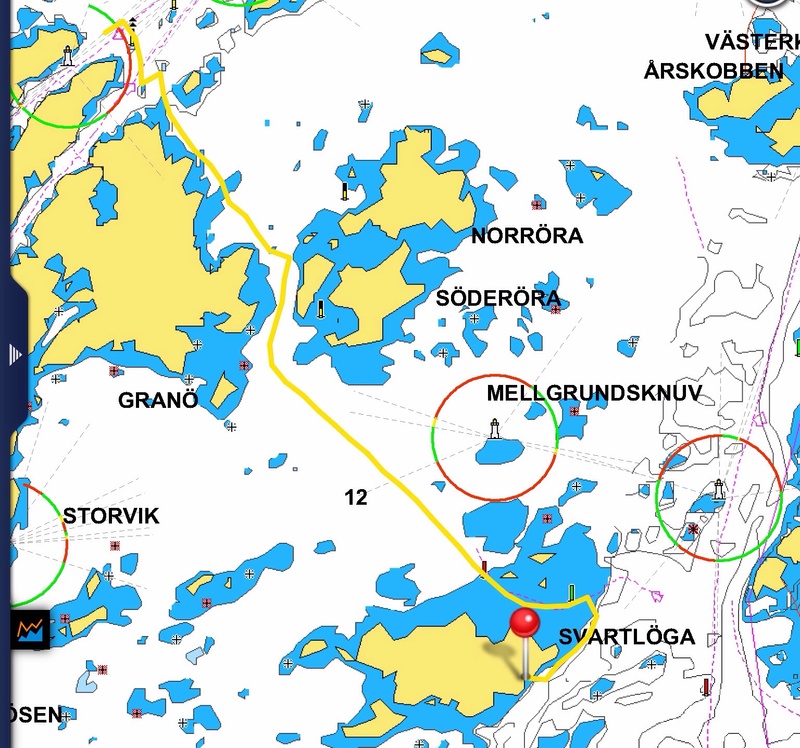 We took the channel to the East of Svartlöga, and tapped a rock with the centre plate only once (stay in the channel, skipper!). 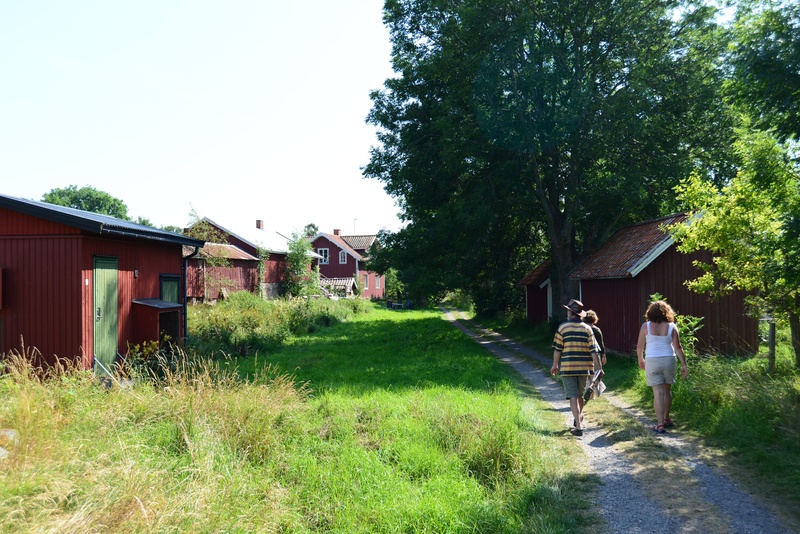 So it was we arrived at our Baltic Base, the summer house belonging to the family of Trevor. It has a little harbour and a jetty, which had plenty of water. Last time we were here, three years ago. However, the level of water was as low as Barbara, Trevor’s mother, had ever seen it. Consequently, we made our way at tickover speed and by Braille. Nevertheless, it was a welcome arrival after our long journey. This post is a bit out of sequence because this blog posting bounced. I think I went a bit mad with the photos! Am trying with none and will add more later. Anyway, this happened before the previous posting…. The day of departure finally dawned. Even though I thought everything was ready, the final morning at home was still a flurry of activity. I realised that I had forgotten to fit plugs where I had repaired the leaking strakes, but fortunately this did not take long. Then, to my dismay, I noticed that the masthead fitting had been dislodged. This meant removing it entirely, cleaning it up, replacing one of the wooden pegs holding it in position and then refitting it. I had to perform surgery on a half-used tube of sikaflex to get enough to make it stick and then hold the whole thing in place with duct tape. I hope it stays secure till the sikaflex cures! I had been looking forward to this trip for so many months, planning the details, checking and re-checking equipment and yet after all this time preparing, I felt curiously reluctant to set off. With the dreaded M25 to battle with before arriving at the docks, I wanted to leave plenty of time for the journey. So it was that Aimee and I finally left to take Aurora on the first leg of her journey to the Baltic. The drive went smoothly, so we arrived at Tilbury Docks in plenty of time. 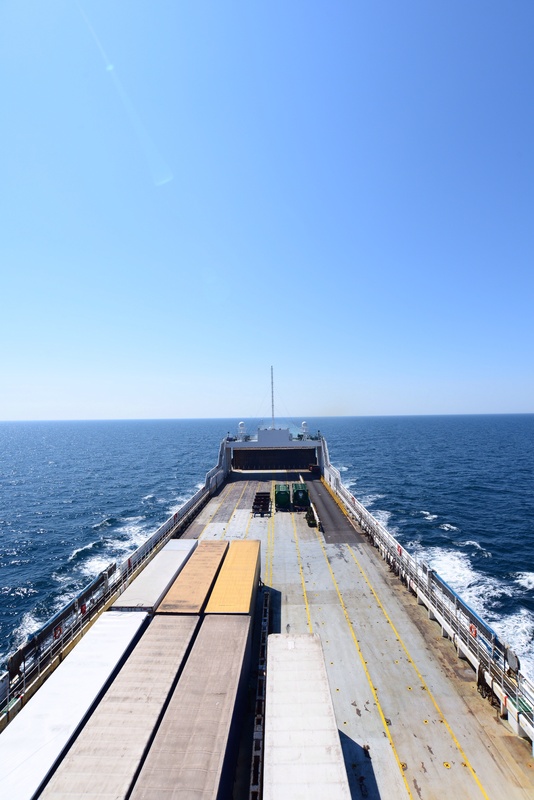 My only experience of large ships is passenger ferries and our ship, the oddly named Transpulp, is a freight ferry and carries a maximum of 10 passengers. We ended up parked with the two other passenger vehicle, whilst one lorry after another roared in to deliver a trailer to the ship. We chatted with our fellow passengers. One vehicle was a 1970s Swedish Army truck, returning from a military vehicle rally in Folkestone and the other was a huge Ford van belonging to Ashley, returning to Gothenburg with stock for his shop- vintage 1940s and 1950s clothing and furniture. Loading was a low key affair and we were soon aboard, led to our cabins and given a safety briefing. It was a beautiful evening and it was a pleasure to watch the docks in the cool air, after the heat of the day. 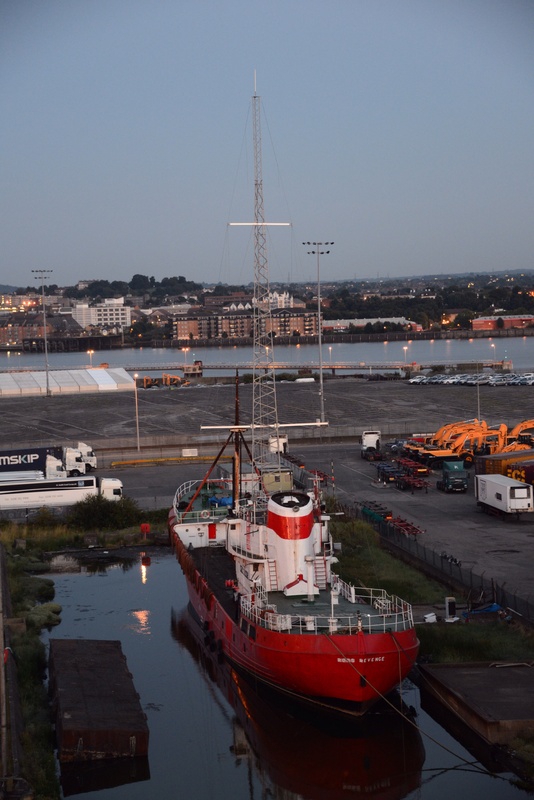 We could also see the original “Boat that Rocked”- the Radio Caroline ship, which awaiting its fate- repair or scrapping, it was hard to tell. Transpulp left her berth and was guided smoothly into a lock only about 3m wider than her 30m beam. From there she moved out into the Thames and made her way downstream into the North Sea. The crossing felt quite unusual to me because the large ship seemed to have so few people on it. There is no separation of the crew and passengers (there were only three others, apart from Aimee and I) and meals are taken all together, at set times. It seems that the life of a seaman has not changed that much over all the years, as much time seems to be spent on keeping the ship clean and tidy- it is amazingly clean everywhere you look. 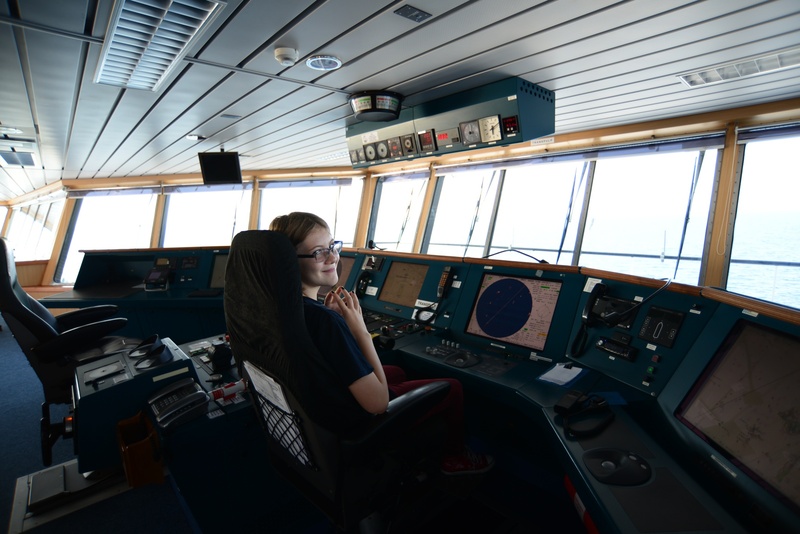 Look out, Aimee’s at the helm! Looking aft- 200m of freighter.